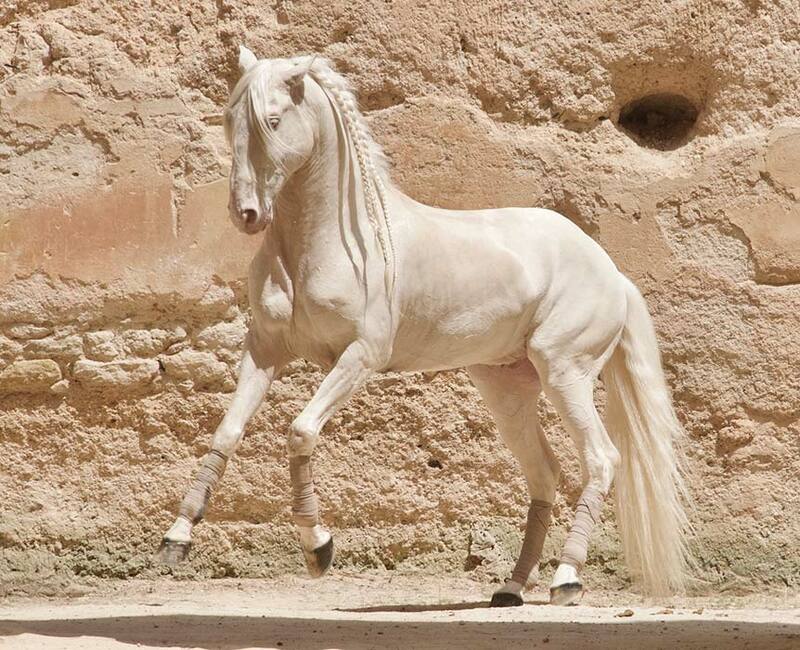 The first time I laid eyes on Chenel, the most amazing Cremello Lusitano Stallion I’d ever seen, as his owner/trainer Sadek El Bahjaoui presented him to us, I literally stopped breathing. I was standing in The Royal Stables in Meknes, Morocco which also was amazing, beyond words. The stables were built during the reign of Moulay Ismail (1645 to 1727). Ismail was a ruthless leader who built The Royal Stables to comfortably house no less than 12,000 of the Royal Horses. The stables were built not just to house 12,000 Arabs, Berbers and Arab-Berbers crosses but also had continuously clean running water to ensure the horses lived in pristine conditions. They also had a granary, large enough to feed all 12,000 horses for 12 years! Mind-boggling! Well, there I was, in the beautiful garden of The Royal Stables. I heard the clip-clap sound of hoofs, and then Chenel (he) appeared. As I said before,I literally stopped breathing. In these many years of photographing horses, I must admit, I’ve seen a lot of them. Some of them were wild, some tame, some large, and some small! I’ve seen all colors and all breeds, but this, this was a creature I’d never encountered before. At first, I didn’t even lift my camera. I was not prepared for an animal such as this. I just stood there, staring at him. When I did finally get him in my viewfinder I realized that my hands were shaking. “Compose yourself” I said quietly, out loud “compose yourself Sandra”. Wow, what an experience! Towards the end of the shooting day, we filed into the interior of the Stables. I found myself right next to majestic Chenel, and I couldn’t help myself. I reached out and touched him way up on his neck and ran my hand across his body all the way to his tail. Time stopped, his muscles rippled under my hand, everything became electric, and everything went perfectly silent. It was a totally out of body experience for me. And frankly, to this day, I cannot tell you how long that experience lasted, this connection between that horse and myself. I can only tell you, it was something I will never forget. And each time I see a photo of him that same electricity pulses through my body, and the entire experience races back to me, what an amazing horse, WOW. Please, if you have any questions regarding this photo or blog, or any of the photos on my website, do not hesitate to contact me. I’d love to hear from you….